The following is an article asking the question: “Is our church environment inviting to all?” If not, then why not? If not, then should it be? Putting my thoughts together, I immediately realized that the risk of sounding like an ‘Old Fogey’ is real. But my goal here is to present my personal experience, and passion for the lost and hurting and not a condemnation of evangelistic techniques. After all, the Great Commission is for everyone. And it is always easy to be critical, it’s much more difficult to be vulnerable to criticism. My favorites memories of attending church meetings are from my early years. We had the traditional Christmas plays, Easter services, Sunday School, and Children’s Church, and Revivals. The children’s church was set up like a mini sanctuary with pews, a stage, and a podium. It was where I learned beloved songs like “Jesus Loves Me, ‘Father Abraham’ and so on. Our church was a type of family environment that after most weddings in the church, the church folk would be invited to the reception in the upstairs. I’d always make extra trips to the peanuts and those little square mints. My first friends were at this church. It was also the environment where I learned my first sign language because we had a member teach us. It was where I had my first ‘girlfriend’, at the age of nine even. I grew up from a baby knowing only one Pastor, Brother Garner. And being the kind of kid that couldn’t always make it through the whole service, I would sometimes fall asleep on the wooden pew. And no, we didn’t have cushions, but I fell asleep just the same. And one of the memories I have is the voice rumbling in the pew. The rumbling I felt and heard was Pastor Garner’s voice. I still remember how the pew would vibrate from the sound of his voice. I consider him my Pastor for all time since he had so much compassion for others, the messages were truth and were in concert with powerful worship. The worship we had was led by a husband and wife. We had a band with drums, horns, and of course a choir. God’s Spirit would often move in the service and even today, I’m reminded of how it shaped my first understanding of what a church is all about. From age 10, I played drums in church. I still remember playing my single Ludwig snare drum in church. When my dad bought a Ludwig Blue Sparkle drumset for me to play in church. I was so happy. I wish I still had it. So fast forward several decades, I’m the son of a Pastor for over 35 years. I spent years playing drums in church, a couple of gospel groups. We traveled to many churches in the ’80s and ’90s. I experienced the powerful movement of God throughout those years while attending Camp Meeting, Youth Camp, and Home Coming services at so many churches. When God moved, there was music, there was preaching or teaching, and a call for people to change through repentance and seeking the Holy Spirit. As a worship musician, I’ve always understood the power of worship in church. Playing in church worship was always one way for me to worship myself. I tell people all the time, when they ask me to play in church, that I’m not a technical drummer. (Truth being, I didn’t pay enough attention to my rudiments and fundamentals in band, which is one of my bigger regrets.) I just like to play and worship.’ I do everything possible to not become a hindrance or focus for anyone worshiping. I’d rather play behind a curtain than have someone watch me play during worship. Warning: Here Comes Somewhat of a Tangent, a Proverbial Squirrel even. During this time, I don’t think myself or anyone who liked Christian Rock music wanted that music in church, we just knew Christian Rock music appealed to a certain type of Christian and we wanted to listen to it because we knew it spoke to us. I still love hymns more than anything, but as a drummer, I could appreciate Christian Rock as long as the message was there. Every album I bought, I always opened up the cover and read the words. After all, the message is the most important factor when listening to someone else speak to your soul. So from my view, the impact today has been just the opposite. When churches ran youth out of their churches saying, – ‘if you’re going to listen to that music, we don’t want you here,’ the impact today is seen in the loss of that generation in the church today. I was even told I would never amount to anything if I kept going like I was in my teen years. And that pastor was right. Unfortunately, that’s the statement that sticks in my head. End Tangent and the Proverbial Squirrel. Going back to what Jesus said about ‘Come to me all who are weary’, the Seeker Church Movement has been well documented over the years. It was/is a movement that sought to create a culturally relevant and comfortable church meeting experience that was inviting without scaring people off. But inviting to whom? There has definitely been a move over the years to implement the tools of the corporate world into marketing church plants. Today, we have in-house free or pay-for coffee shops, free-gifts and give-a-ways, meals after church, and you can even have a beer after church. And the decor resembles your local coffee shop or brewpub. These are all efforts to make the church experience more inviting to those who may find attending a church frightening or a turnoff. There’s an entire science behind church planting with strategies on how you can attract the right people to your church. But at what cost? John MacArthur’s statement is pretty strong. But it does beg the question; are we marketing first and messaging second? I once sat in a two and half hour church planning meeting to go over what type of free giveaways were going to be handed out to guests throughout the year. Relaying the vision and purpose for the same meeting was around three minutes or so. Obviously, there needs to be an organized effort to make sure a church plant, meeting, and events are not chaos. So having a proper method in ‘running’ a church organization is important. The last thing someone experiencing a church meeting about Jesus needs to see is, a messy church environment such as staff not knowing what they are doing. But when does culture comfort become a problem? I once attended a church that handed out a survey asking the congregation what they wanted to hear from the pastor throughout the year. That’s a good way to gauge the needs of a congregation, but I really didn’t see any choices resembling the cannons of Christianity such as Hell, Heaven, Sin, and/or Holy Spirit. A lot of the list was cultural surface emotional issues. In the grand scheme of church leadership, it’s probably a good tool to statistically gauge needs in the church. But it does lead me to imagine Moses going up on Mount Sanai and giving God a list of talking points from the Children of Israel. Here’s a question. What is the right method to reach people? Is it Message or Marketing? Is our goal to use a physical church environment to attract people with methods that are culturally comfortable and then ‘sucker punch’ them with a message about Jesus? Like Christian rock concerts that attract rockers with music and surprise them with a Jesus message at the end. Do we adopt methods from the Timeshare people who give us a 99.95 three day weekend at a resort only after trying to lock us into a condo following an exhausting 2.5-hour meeting? Is Jesus the message and such a draw in our lives that people want to come and see what’s going on at the Sunday meeting? Is the environment used in the physical church meeting inviting to everyone? Do we look forward to the church environment or the transforming message of Jesus? When our lives break down on Tuesday, do we have to wait till Sunday to feel God’s Spirit? Did the Apostle Paul in prison need lights, smoke, and skinny jeans for God’s power to descend and rock the walls? Do we mentally associate God with the church environment on Sunday? When people ask us about our faith, do we talk about the Sunday service, or do we share our story and how Jesus has transformed our lives? Could the thousands of dollars spent on decor be better spent reaching out to someone who is not our kind of church people? Do people come and go from church services without being noticed because they don’t fit the churches environment? Does the ‘Samaritan Woman’ leave our church meetings because she doesn’t fit into the super savvy culture? The Samaritan woman is the perfect example of the message based on the person of Jesus spawning marketing when in John 4:39 “Many of the Samaritans from that town believed in him because of the woman’s testimony, “He told me everything I ever did.” 40So when the Samaritans came to him, they urged him to stay with them, and he stayed two days. 41And because of his words many more became believers.” His words. Jesus first broke cultural norms when he spoke to the Samaritan woman which was in itself a ‘no no’ in that day. I suppose Jesus could have dressed like a Samaritan and fit in better, but he met the Samaritan woman where she was and that day, she became part of the church. He didn’t try to conform her to His ‘culture’ instead He pointed to the purpose of God the father. Despite her difference. Matthew 11:28 “Come to Me, all [a]who are weary and heavy-laden, and I will give you rest.” Jesus said he came for those in need and not the well. So as a church, what should be our meeting environment look like when anyone walks through the door? Should it be one where everyone feels welcomed, comforted, loved? Jesus gives us the best example. His ministry was open and inviting to all, He was irrespective of age, gender, and targeted groups. He stood on a hill and proclaimed the truth to anyone who would listen. Not everyone accepted Jesus either. But He was on His Father’s mission and Jesus didn’t conform to the world’s culture just to get an audience. Would Jesus wear Louis Vuitton glasses and distressed GAP jeans if He started a church in America today? We only need to look at His life for an answer. Jesus’ purpose was to have His life point to God the Father. So I suspect his clothing as it were, would point people past Himself to God the father and not himself. Is the ‘Modern Concert Church’ approach a filter for including some folks and excluding others? Question: Are the Lights, Skinny Jeans, Smoke, Fog, a crutch for worship? Do they create an environment that is faux emotionalism first, and hopefully worship second? What if the poor, non-hip-savvy single mother walks in? Where does she fit in with here second-hand clothing? The Poison concert I went to in 1989 was great. I still remember the drum solo that lifted Ricky Rockett up in the air as he played upside down, laser lights, the smoke, everywhere. Smoke which wasn’t just band generated. There was plenty of secondary drug smoke in the place which no doubt added to the concert experience. Question: Does the church meeting experience or environment welcome everyone? Are we looking for anyone as a disciple, or just those that fit the church meeting culture? The following is the catalyst for this writing. The church we were going to for a while decided to put a bank of ‘lightbright’ bulbs left and right to the middle projection screen used for worship. The challenge looking at the stage was that the collective lumens from the left and right walls of ‘lightbright’ bulbs were brighter than the reflective lumens coming off the projection screen. Lumens are the measurement of light. The walls of light were actually brighter than the projection screen. While it looked artistic, technically speaking, it was a poor design. So my eyes focused on the ‘lightbrights’ and competed with the projection screen. While looking for a church to land and invest in, we visited three ‘contemporary’ churches in our area. Each had somewhat of the same contemporary cultural comfort type feel. Dark or dimming light designs where the lights would go up or down depending on what was going on. And each had a variety of LED lights shining in the darkness pointing at the audience. There were also typical flavors such as contemporary clothing, music was current top 40 you’d hear on KLove and so on. While there were some differences, the approach to worship was pretty much the same, dark concert feel with various lighting themes. During each church visit, we encountered unbalanced LED lights specifically that were pointed at the congregation, or back at the audience. This is the same effect of pointing an LED flashlight at someone in the dark. With each visit, my headaches returned. One church turned the ambient lights up which balanced out the LED’s and this was better, but then they turned the ambient lights back down after the offering. For one service, I spent half the service with my eyes closed. Frustrated and looking for answers to my dilemma, I started researching. I knew the common denominator was the audience-directed LEDs in the dark. To my surprise, I learned I have an issue similar to ‘photophobia.’ And just like you reading this, I did not know it was a thing. But it is real and affects many people. Webmd defines it as the following: Photophobia literally means “fear of light.” If you have photophobia, you’re not actually afraid of light, but you are very sensitive to it. The sun or bright indoor light can be uncomfortable, even painful. For me, my issue is worse with unbalanced-flashlight in the dark type displays of LED lighting pointed at me. Arnold J. Wilkins Professor of Psychology, University of Essex puts it this way.” Most lighting is electric and powered by an alternating current supply, which makes the bulbs continually dim and then brightens again at a very fast rate. Unlike filament lamps and to a lesser extent fluorescent lamps, LEDs don’t just dim but effectively turn on and off completely (unless the current is maintained in some way).” So the refresh or constant flash of light from an LED is harsher on vision because the light completely goes out and back on, and off and on. It was very frustrating trying to visit a church when you have to keep your eyes closed for most of the time. We found a great church that had a nice children’s program, good messages but unfortunately, I couldn’t go there because of the LED’s pointed back at me in the dark. And I hesitated to even bring it up to the churches I visited. But my frustration was real and I wanted to find a church that spoke the truth and could invest in. If you read the manual on LED lights such as those used by DJ’s and churches, you’ll often see the warning, “Avoid direct eye exposure to the light source while it is one.” or “Avoid direct eye contact to the light when in operation”. If you don’t see the warning, the manufacturer isn’t being responsible regarding the risk of direct LED exposure to people’s eyesight. So why point them at people in the church? Not sure other than it’s popular and hits the dopamine in the right place. LED lighting industry-wide is typically used to UP light a wall or other object like a ceiling. 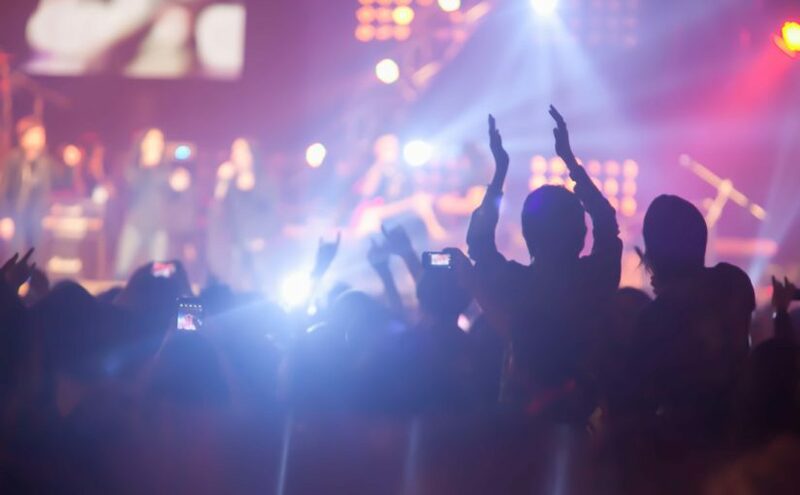 Technically speaking, pointing them at a crowd diminishes their effectiveness since the idea is to shine the LED light onto an object and change the color of an object. But the risks to people’s vision is real and should be considered as a warning when using LEDs in this way. These visits were the catalyst for this Open Letter. So I began to question my beliefs about church meetings. Is our goal for the physical church visit to be inviting to all? Does our church environment filter out some folk and include others? Is that Biblical? Do we as a church take our lead from corporate America and target certain groups for inclusion and others for exclusion? Do we need to dress fly like G.Q. Magazine. Does a church meeting need to be culturally comfortable? Is our message of Jesus what attracts people to a gathering, or is it multicolored smoke? Do we take from Paul that worship in jail can ‘attract’ someone to salvation or do we need wood textures on our church building walls? About the Author: Steven Davis is a preacher’s kid for over thirty years, Bible school drop out, musician and media producer with over a decade of video, photography and lighting experience.